I looooove making dump cakes. I've made a peach version, and a pear version, and other versions I haven't even posted on here. Whenever I find myself in need of a sweet fix, which admittedly, seems to be pretty frequently these days, and I have some leftover fruit, this is a go-to that never disappoints! The best part is that the ingredients are minimal, and it's just soooo freaking easy. People always love this dessert, too. Obviously an added bonus. Now, the versions I made before are made in big pans, but I have been scaling back and making smaller versions lately. This is good if you, like me, are planning on eating the whole thing. My husband and I will eat it over a number of days, of course, but still, in this case, less is more. In the case of this apple cake, I had some lovely organic apples that I just wasn't able to get to in time and I didn't want them to go bad. 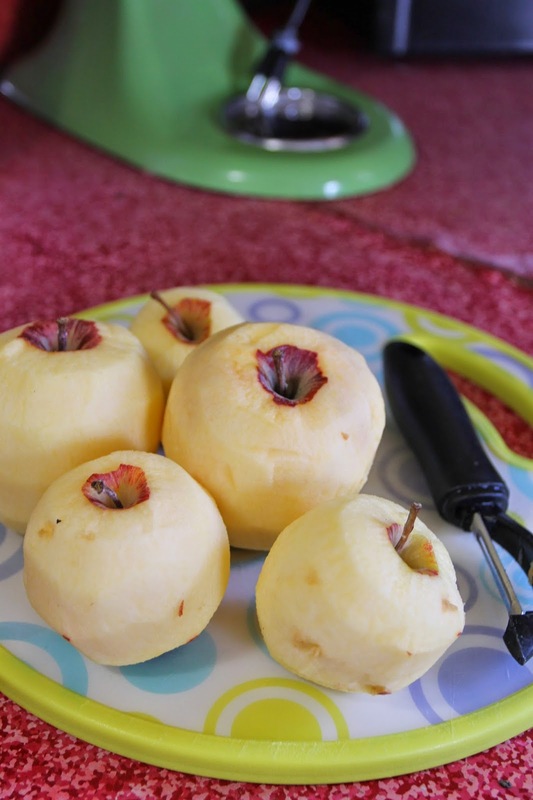 Here are my apples. Pretty obvious, I know. You can use five, or you could use six. Or use seven if you're feeling crazy. My point? Use 'em what you got 'em. Then, throw them in a greased 8 by 11 pan. Then, dump half a box of cake mix on it. (If you double the recipe, use a whole box.) If you're like me, you make your own cake mix. I use THIS RECIPE, which I love, and use half and bag half for later use. 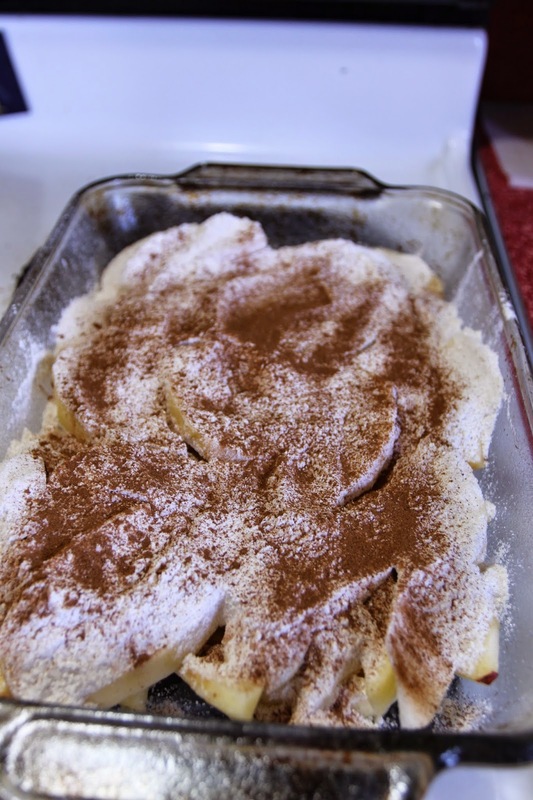 Then you can sprinkle a whole bunch of cinnamon on top. YUM! Next melt down half a stick of butter and pour it over the whole dang thing. Don't feel guilty. There's a lot of fruit in there! 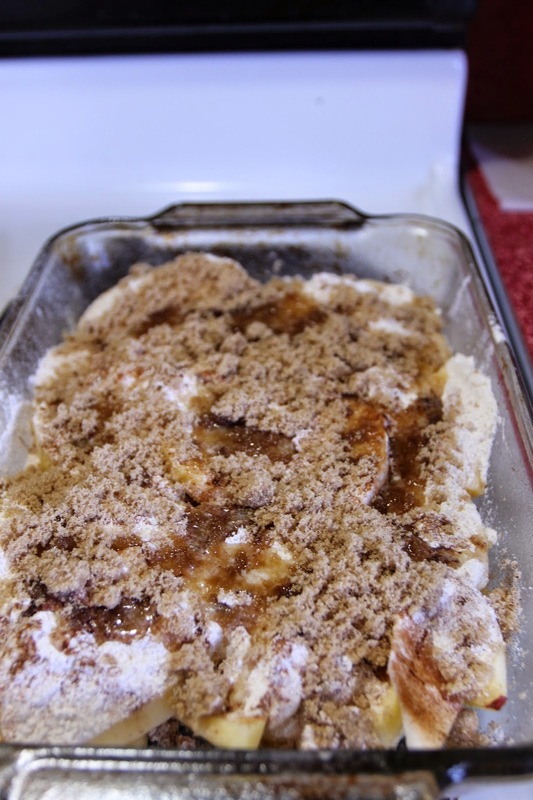 And finally, three heaping tablespoons of yummy in my tummy brown sugar goes over the whole thing. Then you bake it for 40-50 minutes at 350 degrees. And it comes out all delicious and lovely! I really feel like it's not a cake at all, but hey, what do I know? Not that I really care, honestly because it just tastes great. I serve mine hot with whipped cream because why not? It's a dessert that just warms my heart and soul. Preheat oven to 350 degrees. 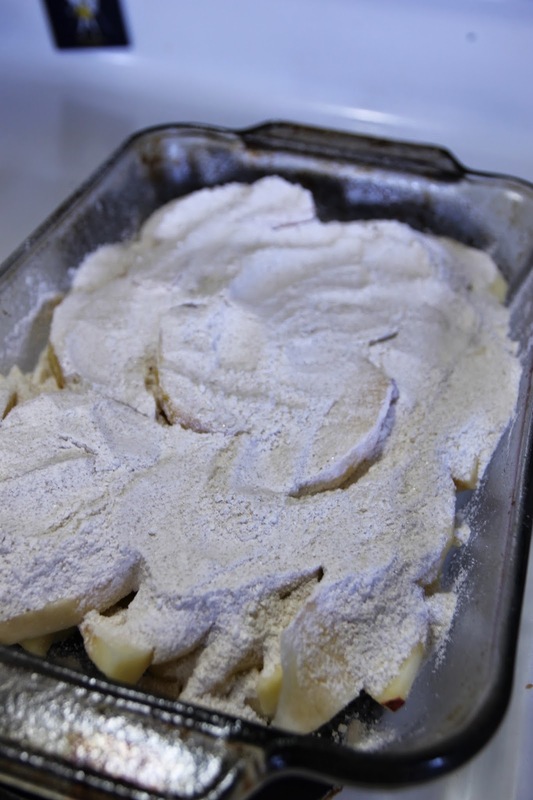 Grease your casserole dish. 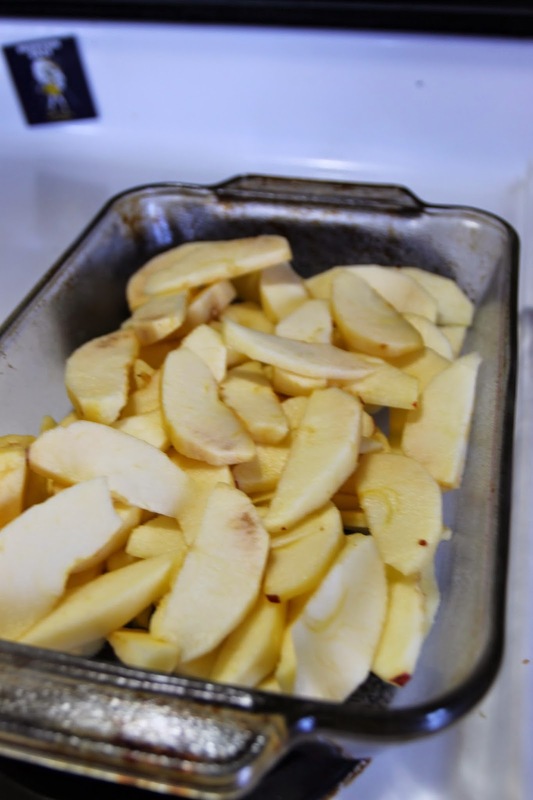 Place your sliced apples in your greased dish. 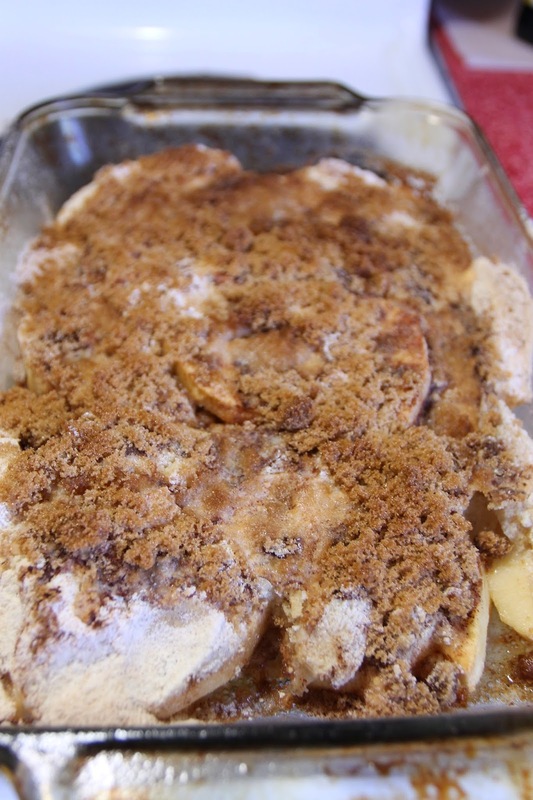 Pour your cake mix over the apples. Don't stir it. I know you'll want to because how could anything so good be so easy? But it can be. Don't stir it. Liberally sprinkle cinnamon over the cake mix. Inhale the wonderful scent. It's great! Drizzle the melted butter over the whole thing. Sprinkle the brown sugar over the whole thing. No stirring. I know. Put the dessert into the preheated oven and bake for 40-50 minutes or until it looks all yummy and done and stuff. Serve hot with whipped cream. Life is good. Lets hope when I make this one it turns out better than my Blueberry sour cream cake did! YIKES! Oh no! Did you not have good luck with the blueberry sour cream cake?! I have to say, my KitchenAid mixer was a big help with that one. This one should be easy and you can use ANY fruit! Let me know how it turns out! Well after it baked for like 30 mins longer than it called for the middle was finally set! Erin said it tasted pretty good but boy was it ugly!! I might make this one tonight so I will let you know! So if this was supposed to be more like a cobbler than a cake then it was a success! lol Tasted good, but was no where near a cake consistency! It is called "cake" only in name...I guess because there is cake mix used? I was confused about this as well when I made the original one (peach). Haha. But it sure does taste good!!! Glad it turned out! I Hate Your Kid's Made Up Name! Everyone Has a Spirit Animal Except Me!